Laura Thweatt was hiding somewhere in Boulder, CO. Well, maybe not hiding. That’s a misnomer. She’s been in plain sight for quite some time, but it’s taken until just now for people to find her. But in the moment, I was searching for her, literally. I had no idea where she and the rest of the Boulder Track Club had ended their run. And I had all of their belongings. And their truck. And it was about to run out of gas. Things looked the opposite of good. In light of my impending doom, all I kept saying was, “I really hope I find her soon.” It’s like if I kept frantically repeating the sentence, it would come true. And it did, because the next day, I found her back in Boulder. The search only took 25 years. Before getting to how I left a promising, young U.S. distance star stranded after a grueling 17 mile net uphill run at 9,000 feet, there should be an explanation for how this all began. Laura Thweatt is the best runner you only sort of know. She’ll pop up every now and then, like when she ran a 1,500-meter (4:15.89) and 5,000-meter (15:23.43) single-day double at the Stanford Invitational, and then made her way back towards the mountains, long before you could catch her name. In the last year, the University of Colorado alumnus dropped her two-year-old personal best in the 1,500-meters from 4:27.96 to 4:10.55; lowered a three-year-old personal best in the 3,000-meters from 9:33.56 to 9:01.58; and crushed her 15:36.95 one-year-old personal best in the 5,000-meters with a stunning 15:04.98 at the Payton Jordan Invitational. She also made some appearances on the .US National Road Racing Circuit, highlighted by a fourth at the U.S. 5K Road Championships and, alongside Molly Huddle and Shalane Flanagan, she made the podium at the U.S. 12K Road Championships. Born in a small outdoorsy town of Durango, Colorado Thweatt didn’t start running until high school school when her best friends went out for the team. At the time, she considered herself a volleyball player, but soon discovered a wealth of untapped potential. Running was something fun for Thweatt, up until the end of her junior year, when it became a bit more serious. Now smitten with the sport, Thweatt, like all newly indoctrinated runners, gravitated towards the University of Oregon and the cult of Steve Prefontaine. She even had a big yellow ‘O’ on the back of her car. The search for Thweatt began at Settler’s Car Park. The tiny lot is located on the edge of downtown Boulder, right before the mountains form and single lane roads through canyons begin. It was here that I was meeting Thweatt, two other Boulder Track Club members, and the team’s coach, Lee Troop. Born in Geelong, Australia, Troop, a two-time national champion and former 5,000-meter national record holder (13:14.82), arrived in Boulder via word of Australian world champion marathoner Robert de Castella. Looking for a different training environment, Troop made his way to Boulder during the summer of 2002 before heading over to Europe to race. He did the same the next summer and then in 2009, he made the move permanent. I hoped in Troop’s black Dodge Dakota and we started our ascent to Gold Hill. After some brief introductions, I asked where exactly we were headed, which Troop allegorically explained. In 2002, Troop met up with Silvio Guerra. The Ecuadorian marathon national record holder (2:09:49) was coming off a runner-up finish at the Boston Marathon and, that summer, asked Troop to accompany him on a run. “We went out there to do this run,” he says. 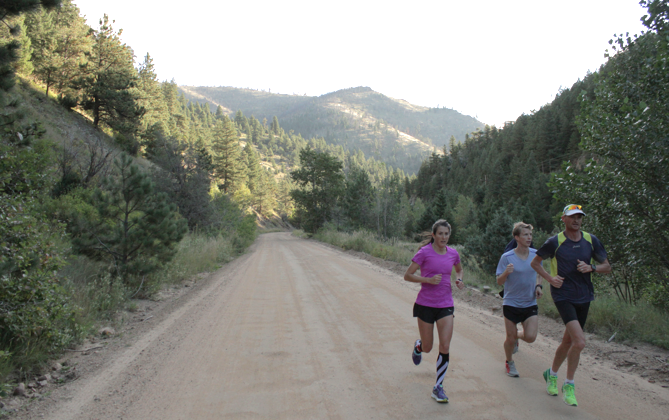 “We were running 5 miles along the flats and then it’s just like a 5 mile climb that goes all the way up to 9,000 feet. It was pretty rough and rocky. “Yeah, yeah yeah,” said Troop, “but, you know, how often would you do it? Like once every two months or three months? 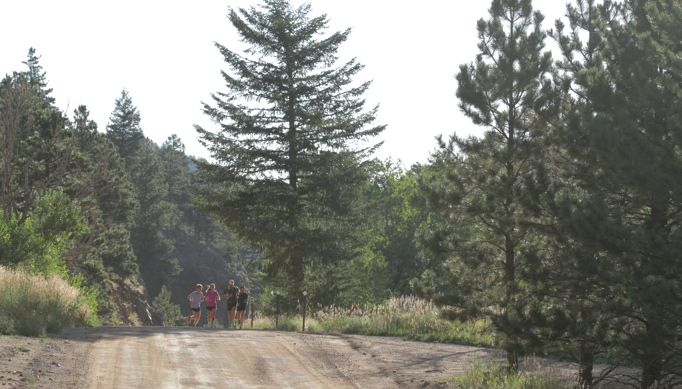 While Magnolia Road gets most of Boulder’s running reverence from the Running with the Buffaloes lore, it’s Gold Hill that truly tests a runner’s mettle. Magnolia Road may be a challenge, but Gold Hill is what sleep under Magnolia Road’s bed. It’s not for the faint-hearted. The car soon turned off Boulder Canyon Drive and onto the switchbacks of Four Mile Canyon Drive. Somewhere on this road, lies the home of the University of Colorado’s Head Coach Mark Wetmore, who, when Thweatt wasn’t contacted by Oregon, stepped in and recruited the Colorado State Meet runner-up. Having only run 25 miles per week in high school, the foray into college running was always going to be a gradual progression for Thweatt. Building up to the roughly 50 miles per week as an underclassman and eventually topping out at around 75 her senior year, Thweatt grew under Wetmore and assistant coach Heather Burrough’s guidance. Though she left with personal bests of 15:56 (5K) and 33:49 (10K), Thweatt was hampered by injuries her first two years, and, like how she began her running career in high school, still thought she had untapped potential. Colorado has a bit of a habit to develop national caliber runners that still want to compete after they’ve turned in their Colorado jersey. Take into account all of the post-collegiates — from sub-elite to world-beaters — that have been under Wetmore’s guidance, and consider the longevity of each of their careers, and you have a fairly successful formula for seeing the big picture. But upon graduating from Colorado, Thweatt, who majored in sociology, didn’t know what to do next. Far from being offered a contract from a shoe company, Thweatt was about ready to head back to CU for graduate school and not step into the abyss that is professional running. If not for her teammate and good friend at Colorado Matt Tebo, that’s how Thweatt’s story would have played out. “Matt and I graduated the same time that I did,” she says. “We both had ups and downs with college. He started talking to Lee about a month or two before I did, and ended up joining Boulder Track Club. After some persistence, Thweatt finally sat down with Troop, and the rest is history, or so they say. She’d give it an all-in year with Troop and Boulder Track Club, see what happened, and then make another call whether the path she chose was going to be worth to continue. Three years later, Thweatt is still with Troop and Boulder Track Club, and has blossomed into a national-class athlete. The truck, filled to the brim with antsy runners, cut back and forth along the jagged turns until it reached the town of Salina. Devastated by the flash flood that tore through Boulder last September, it has since recovered and restored its mountain town charm. Established in 1874, Salina is located 16 miles southeast of Gold Hill. There’s only one road up from Salina’s 6,600 feet elevation to Gold Hills’ 8,300 feet peak, which is the aptly named Gold Hill Road. Both Salina and Gold Hill were established after the state’s first major discovery of gold during the 1859 Colorado gold rush. Both towns, which are isolated in the mountains, have no paved streets, making them ideal for runners and bikers. 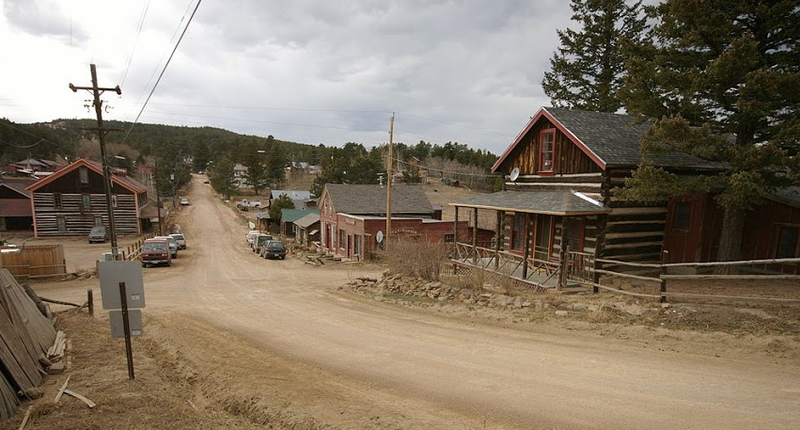 Gold Hill is a town lost in its past, with many of its original wooden buildings still standing, albeit somewhere restored over the past century and a half. Despite having only two major streets and one stop sign, I somehow managed to get lost in it. The plan was to continue along Four Mile Canyon Drive, cut up through the trail, pop out at Gold Hill, and come back down Gold Run Road. Simple enough. The group parked in Salina, gave me the keys to the truck, and made their way southwest on the road. I sped ahead of the group, intermittently coming to a stop to take picture, before speeding up again to repeat the process. After a few uphill miles, the dirt road became a dirt trail, which meant I had to turn the truck around, head back down, and then back up the switchbacks to Gold Hill. The problem with our rendezvous, one of many attributed solely to me, was that I didn’t really have a plan. I figured I’d just drive to the top and meet them there. The problem was that without any knowledge of the area, maps, or cell phone service, I had no idea what to do if I ran into trouble. Unlike my overconfident self, Thweatt and Troop sat down, and planned out not just the next year, with an emphasis on the next four. 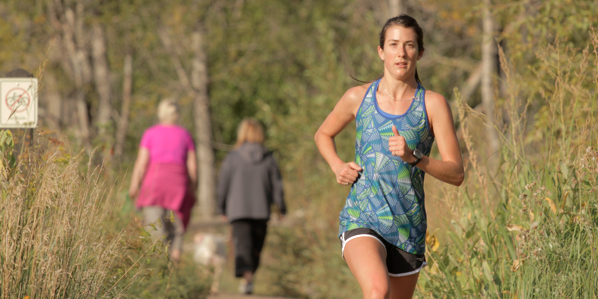 After four months of training, Thweatt headed to Seattle, Washington for the USATF Club Cross Country Nationals. She finished sixth. The rest of the year didn’t fare as well as the start. Though Thweatt set personal bests at 5K (15:43.32) and represented Team USA at the BUPA Great Edinburgh Cross Country (10th overall) and the NACAC Cross Country Championships (3rd), she failed to qualify for the 2012 Olympic Trials. Considering Thweatt had never qualified for an NCAA Championship, the change in expectations was the beginning of things to come. The next year-long cycle was “good, but not quite where I wanted to be,” Thweatt says. She again dropped her 5K personal best (15:36.85) at the Stanford Invitational and then came back to venue to set a a new 10K best of 32:15.51 at the Payton Jordan Invitational. With plenty of momentum behind her, Thweatt opted for an indoor season, mainly due to the fact that 2014 was a down year and the only international team one could make was for the IAAF World Indoor Championships. “We thought the season would be fun, too,” she adds. Focusing on a few less miles and faster paces, Thweatt set a 3K personal best at the Washington Husky Classic (9:01.58) before finishing sixth in a fast closing 3K at the USATF Indoor Championships. The speed translated well to outdoors, where she set another personal best, this time in the 1,500-meters. At the Brooks Mt. SAC Relays, Thweatt took the bell and tried to kick from 400-meters out. Although she was overtaken by Sara Vaughn and Lea Wallace, the race served as yet another small confidence booster as she soon would stepped back up in distance. I was too busy taking pictures of Sugarloaf Mountain to notice the passage of time. A few miles west of Gold Hill sat Rocky Mountain National Park, a serene oasis of rolling hills and cascading hills. I was supposed to meet Thweatt and the Boulder Track Club at the intersection of the Switzerland Trail, the trail they took from Salina, up to the only road in Gold Hill. I sat and waited. 10 minutes passed. I waited. Another 10 minutes passed. I thought about driving back into town. Another 5 minutes passed. I started to get nervous. Another 5 minutes passed. I hopped in the truck and made my way down the dirt road, back into town. While I said there was only one road leading up from Salina to Gold Hill, there’s actually two roads that originate in Boulder. 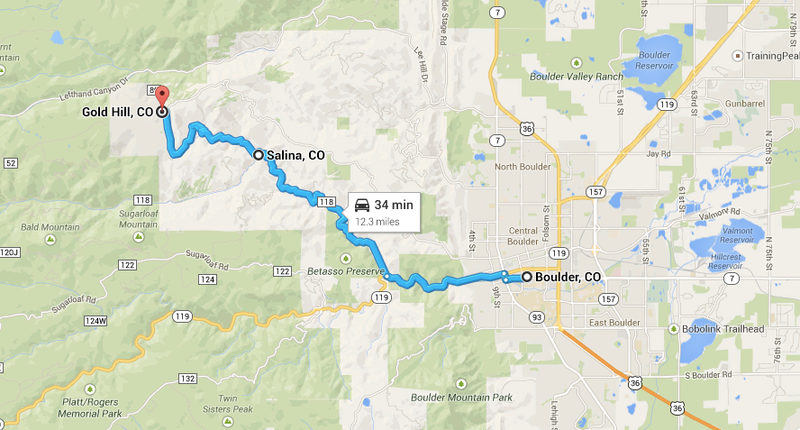 One is the aforementioned Gold Hill Road, and the other, which bypasses Salina, is Sunshine Canyon Drive. When I pulled back into town, I spotted some women sitting on the porch of a wood cabin, rocking back and forth in handmade chairs. There was a German Shepherd at one of the woman’s feet. I couldn’t make this up, even if I tried. Because I was starting to get concerned, and because I had no cell phone service, I asked the women if they had recently seen a group of four runners in town. “Oh yes,” one woman replied, “They went that way.” She pointed towards Sunshine Canyon Drive. Without even thinking, I thanked the locals, and barreled down Sunshine Canyon Drive. Now, the drive down Sunshine Canyon Drive to Boulder was only 15 miles, but it took about 45 minutes. That was because the dirt paved switchbacks had no guardrails, and when you’re trying to drive someone else’s Dodge Dakoka, a hundred foot drop sounds a bit life threatening. Don’t get me wrong here, the view of Boulder and its surrounding forests was serene, but it wasn’t worth dying over. After Mt. SAC, and more confident than before, Thweatt took to the Stanford Invitational. She would again be running the 1,500-meters, but there’d be a twist this time around: she’d be doubling back and running the 5K later that night. “I remember when Lee told me and Sean [Quigley] that we were going to do this double and thinking there was no way I could do that,” Thweatt laughs. Now a bit more experienced at the distance, Thweatt kicked from nearly 700-meters out and won the second section of the 1,500-meters in 4:15.89. The winner of the first section, Amanda Mergaert, ran 4:16.16. Thweatt came that night for the second half of her single-day double. 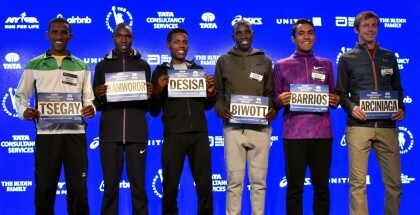 Despite running on marginally tired legs, Thweatt felt relaxed throughout the race, which she attributed to having got out her initial nerves in the 1,500-meters. Feeling surprisingly good, Thweatt took the lead once Stanford’s Aisling Cuffe dropped out at 2,800-meters, and led for the majority of the rest of race. She would come away with a 15:23.43 third place finish, which was a new personal best. Thweatt was in store for another surprise at Stanford, but this time, at the Payton Jordan Invitational a few weeks later. Having run two personal bests last time out, Thweatt and Troop thought that the year’s time goal of 15:10 might be in the cards. The world-class field lined the track for the women’s marquee event. With the rabbits up front, the huge field started to string itself out. Just like last time, once the rabbits dropped out, Thweatt found herself at the front. Rather than wait for someone to come up and take the lead, she took the reigns herself, and continued to tick off laps. Again, the finish was more of the same. While Thweatt didn’t have the wheels to hang with the leaders, who dipped under 15 minutes, she did come away with a massive personal best — 15:04.98. By the season’s end, the mark would make her the fourth fastest American women in 2014 and the 20th fastest U.S. woman of all-time. The rest of her summer was bit of a mixed bag: a 7th place finish at the Oakley New York Mini 10K (32:37) and a 14th place finish at the Prefontaine Classic 2-Mile (9:44.46). By the summer, her season ended up being derailed by a stress reaction before the U.S. Outdoor Championships. Now healthy, Thweatt takes to this Sunday’s Philadelphia Half Marathon, with the hope to start another season on the same, strong foot. Still, the season had been another one of improvement. This time, it hadn’t been just a small, incremental jump: it had been a gigantic leap. I’ve never been lost at sea, but I imagined that this is how it felt. Low on gas and all sense of direction, I was drowning in my own ignorance. “This was the end,” I thought. I eventually made it back up to the top of Gold Hill with less than 1/16 of a tank of gas. This time, I took the other road, the road which I initially drove up on, and drove back down to Salina. The car was in neutral almost the whole way down. I had gone through the first four Stages of Loss and Grief — denial and isolation, anger, bargaining, and depression — and now found myself at acceptance. It was over. This was it. I rounded the final switchback and drove to where the run had started. My small glimmer of hope was quickly and unceremoniously dashed as there was no one to be found. Devastated and defeated, I got out and stood on the truck’s flatbed, yelling into the distance, like some crazed maniac who had lost all hope. But then, something happened. Something magical. A silver truck pulled up alongside mine and out popped this random man’s head. “Are you Mitch,” he said, smiling.” I nodded yes. Some people don’t believe in the divine no matter how much proof they see of it. Scrawled on a piece of paper was a short message, hoping that I was alright, and instructions of what to do with the truck. The Boulder Track Club had safely hitchhiked back into town hours ago. They were long gone. I drove the truck back to Settler’s Car Park, left the keys in the gas casket, and drove away in my Honda Civic. In order to save face, I hoped that I’d never see any of them again. It’d be too embarrassing to explain this whole story to them. But, the next day, I met up with Thweatt for a short 10 mile run. She was doing an out and back. I stayed at the start and waited for her to return to the start. Sometimes the answers come to you. My journey had led to an understanding of Thweatt, just not in the way I’d expected. I went to Boulder to find her, and her story, which I came across, eventually. But just because I found Laura Thweatt, literally, doesn’t mean her story is over. She’s still looking for the ending. Mitch Kastoff is a freelance writer based in Portland, Oregon. Contrary to popular belief, he did not invent the high five. If you enjoyed these ramblings or have any comments, questions, or concerns, feel free to reach him on Twitter or by email.